Using the app is the best way to protect your information. 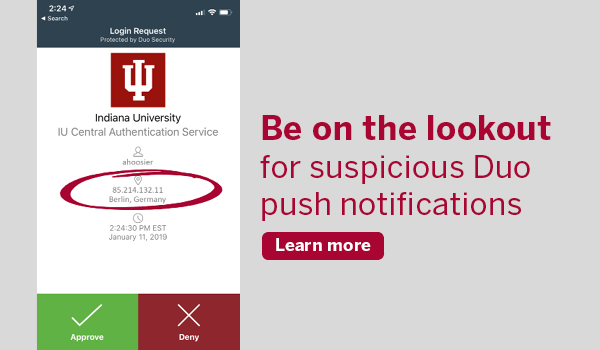 If you’re an IU student, staff, or faculty member, you’re well aware of Two-Step Login (Duo) and how it protects your data. In fact, in the two years that IU has been using two-factor authentication, it’s been 99% effective at stopping phishing attacks. Clearly, it’s working. But did you know that the UITS-recommended option is the Duo Mobile app on your smartphone? The Duo Mobile app is the most versatile choice, because it works without a cell or Wi-Fi connection and you are likely to have your smartphone or tablet with you when you need to use Duo. Awards to be presented at the CEWiT Summit in March. Do you know someone who is an advocate for women, who motivates you to do your best, or who has made a difference in your experience studying or working at IU? The Center of Excellence for Women in Technology (CEWiT) is seeking nominations for the Outstanding Faculty and Staff Mentor/Sponsor awards, to be presented at the CEWiT Summit Banquet on March 1. Applications are due by February 28. The National Center for Genome Analysis Support (NCGAS) at IU is offering a workshop on high performance computing usage and de novo transcriptome assembly on May 1. The three-day workshop, sponsored by the National Science Foundation (NSF), will include discussions, lectures, and hands-on tutorials related to getting started constructing and analyzing transcriptomes without the use of a genome. Registration for the event is free, but you must apply to attend. The deadline for submitting an application is Thursday, February 28 at 5pm EDT. IU has been leading the project since 2014. Jetstream, a production cloud system for the national science and engineering research communities, received an award of $1.3 million from the National Science Foundation (NSF). The award will fund Jetstream operations through 2020. Jetstream is a collaborative project between Research Technologies at Indiana University and university partners across the country. More than 2,500 researchers and students across the country have used the system to access computing and data analysis resources on demand. New hands-on course will cover the basics of the web-based platform. Whether you’re a new user of IU REDCap (Research Electronic Data Capture) or just need a refresher, you’ll gain plenty of knowledge in this 90-minute workshop. REDCap is designed to support data collection and management for research, operations support, and quality improvement projects. Module focuses on sudden unexpected death in epilepsy. Dr. Stephen Downs, researcher-entrepreneur at the IU School of Medicine and founder of Digital Health Solutions, developed software designed to alert physicians to the risk of sudden unexpected death in epilepsy (SUDEP) during a patient’s routine visit. As part of the Child Health Improvement through Computer Automation (CHICA) system, the software shares a family’s responses about epileptic seizure with their physician and provides reminders for physicians to discuss SUDEP with the family.